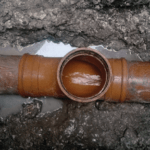 Drainage engineers from UKDN Waterflow (LG) Ltd have found that tree root infiltration at a residential care home has been the cause of flooding problems at a neighbouring property. The national care home group called in the UKDN Waterflow (LG) team to investigate when the flooding occurred after a period of heavy rainfall. The incident illustrated the challenges faced by property owners as tree roots can infiltrate drains and sewers, damaging pipes and increasing the risk of major drainage blockages. UKDN Waterflow (LG) Operations Manager Simon Sheridan said: “We deployed a water jetting vehicle and a CCTV camera survey unit to investigate the cause of the flooding. “The teams lifted a manhole and found it was filled with tree roots. It was clear that the roots were reducing the capacity of the drain. The jetting unit was used to clear silt and debris that had backed up behind the tree roots. Then the CCTV drainage survey team captured HD quality video images of the tree roots in the pipe. The desilting work carried out by the UKDN Waterflow (LG) team eased the pressure on the drain, but it was looking likely that a longer term solution to cut out the roots would be needed. In most cases, roots get into drainage systems through the joints in pipes. Then, as the roots grow, they can cause further cracking and movement which can lead to the pipe collapsing. Over a number of months, and years, drainage pipes can become blocked for many metres. Other debris that should not be in pipes, such as wet wipes and fat, can collect around tree roots, speeding up the drain blocking process. Simon Sheridan said: “We have known tree-lined roads to have drains and sewers to be infiltrated with tree roots for up to 200 metres. UKDN Waterflow (LG) can use a range of techniques to tackle the problem – including high pressure jetting, at 10,000 PSI (pounds per square inch) to cut the roots from the pipe, or specialist robotic cutters, such as the KA-TE cutter. This device can be guided along the pipe then controlled using a mini camera to remotely grind through roots, which can be several inches thick. Simon Sheridan added: “The longer that tree roots are left to grow in a pipe the worse the problem gets. Significant and costly remedial work may be needed to repair sewers and drain pipes once the roots are removed. “This can involve the need for patch lining of areas of pipe cracked or dislodged by the growth of roots. Or, where no-dig solutions cannot be used, drains may have to be excavated and replaced. “The best answer is to carry out regular preventative maintenance. This might involve annual drain inspections on high risk areas, where tree root infestation in drains is most likely.